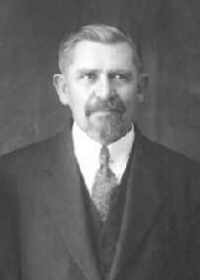 Johann G. Wiens: missionary and Bible school teacher; born 3 August 1874 in Steinthal, Molotschna Mennonite Settlement, South Russia. He was the youngest of twelve children of Gerhard Friedrich Wiens (13 February 1827–2 November 1876) and Susanna (Friesen) Wiens (3 April 1832–3 March 1907). Johann married Helena Hildebrand (6 October 1877, Tiege, Molotschna - 29 May 1968, Winkler, Manitoba, Canada) on 12 November 1896. She was the daughter of Heinrich Hildebrand and Elisabeth (Klassen) Hildebrand. Johann and Helena had a son, a daughter, and a foster daughter. Johann died 2 January 1951 in Winkler, Manitoba. Johann received his elementary and secondary education in his home community and attended the Baptist Seminary at Hamburg, Germany from 1899-1903. He was baptized in June 1900. Johann and Helene served a term as missionaries in India from 1904-10. In 1918 Wiens was the leader and teacher of the Tchongrav Bible School in the Crimea, positions he held until 1924. Wiens immigrated to Canada in 1926 where he taught at the Winkler Bible School, operated a garage in Winkler together with his son, and preached throughout the Mennonite Brethren constituency in Canada and the U.S. when the school was not in session. Friesen, P. M. Die Alt-Evangelische Mennonitische Brüderschaft in Russland (1789-1910) im Rahmen der mennonitischen Gesamtgeschichte. Halbstadt, 1911: 567. GRANDMA (The Genealogical Registry and Database of Mennonite Ancestry) Database, 7.04 ed. Fresno, CA: " California Mennonite Historical Society, 2013: #63697. Reimer, Margaret. The Crimea Bible School, 1975. Unruh, Abr. Die Mennonitische Bibelschule zu Tschongraw, Krim, in Russland. Warkentin, A. Who's Who Among the Mennonites. North Newton, KS. 1943. Wiens Frank J., Hans J. Wiens, and Harold J. Wiens. The Wiens Family Legacy: Descendants of Gerhard Friedrich Wiens. S.I. : s.n., 200-. The personal papers of Johann G. Wiens are with his nephew, Harold A. Wiens, in Winnipeg, MB. Krahn, Cornelius and Richard D. Thiessen. "Wiens, Johann G. (1874-1951)." Global Anabaptist Mennonite Encyclopedia Online. December 2013. Web. 25 Apr 2019. http://gameo.org/index.php?title=Wiens,_Johann_G._(1874-1951)&oldid=139588. Krahn, Cornelius and Richard D. Thiessen. (December 2013). Wiens, Johann G. (1874-1951). Global Anabaptist Mennonite Encyclopedia Online. Retrieved 25 April 2019, from http://gameo.org/index.php?title=Wiens,_Johann_G._(1874-1951)&oldid=139588. Adapted by permission of Herald Press, Harrisonburg, Virginia, from Mennonite Encyclopedia, Vol. 4, p. 1136. All rights reserved. This page was last modified on 18 October 2016, at 15:46.